A SPECIAL audit into the procedures that led to the approval and construction of expensive villas and a hotel in an environmentally sensitive sea caves area in Peyia, Paphos, has uncovered a litany of irregularities, according to a report published on Friday. The audit had been requested after a public outcry over the construction projects in the sea caves area, one skirting the boundaries of the Akamas national park, as well as other Natura sites, which had not been properly and adequately assessed by the environment department. The submerged and partially submerged sea caves are the birthing habitat of the Mediterranean Monk Seal (Monachus monachus), which is listed as the most “critically endangered” marine mammal species in the Mediterranean by the International Union for the Conservation of Nature. According to the audit service, the probe found numerous “weaknesses in the procedures that were followed, both in changing the building zones” after appeals were satisfied, but also in relation with the permits issued in the sea caves area. The appeals were filed by Peyia Municipality in 2003. The report said the plots in question came about after the redistribution of land in 1988, done for farming purposes. The audit said that at least the plots next to the coastal protection zone could not be developed because of the rocky terrain and questioned why they had been included in the redistribution in the first place. No environmental study had been carried out, in violation of EU directives, while the zoning changes, following appeals, raised the building coefficient almost threefold. The audit also found that the appeals had been filed after the deadline and the Peyia mayor sat on the three-member panel that assessed them. In 2007, a few months before the appeals review was finalised, three significant sales transactions were done in the area. The land was bought by developers who benefitted from a spike in value after the zones were changed. Six villas were constructed on one of the plots, with sales documents filed at the land registry many months before the environmental impact had been assessed and before a town planning permit had been secured. The municipality had also requested an extension of the tourist zone to supposedly enable a large family to meet its housing needs. Despite the findings, there is little or nothing the authorities can or are willing to do to rectify the situation. A ministerial meeting in March decided that the clock could not be turned back and authorities could only limit the damage by rectifying some other illegalities and take steps to avoid them in the future. The meeting heard that some eight irregularities will have to be restored at one of the two main projects in the area, Korantina, including kiosks, a lifeguard tower, and rock works. The ministers were assured that the projects are not expected to have irreversible effects on the area’s environment. 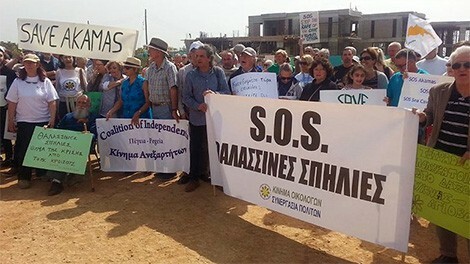 The area where the six villas were being constructed by Leptos, had been rezoned in 2008 nine days before the presidential elections by then interior minister Christos Patsalides. Patsalides defended his action arguing that he had simply accepted the recommendations of experts, which had been prepared following consultations with local officials, the district administration and the union of communities. No one had objected after the publication of the decision, he said. The former minister in the Tassos Papadopoulos administration questioned why building permits were granted 10 years later if the decision at the time had been wrong. “Despite the findings, there is little or nothing the authorities can or are willing to do to rectify the situation.” Wow, what a spineless bunch. In Spain, and also in the UK, any irregular construction is bulldozed, and the developers can face jail time !!! The authorities in Cyprus seem to be experts in “not being able to do anything” after property and environmental rules rules are fragrantly broken or ignored! The result seems always to be “another fine mess” they’ve quietly washed their hands of. As usual we will never find out who paid for the “weaknesses in the procedures that were followed’ or who received the lesser spotted brown envelopes to make this happen. Because no one is prepared to rock the boat that all of the usual suspects sail in. These are the two faced crooks who complain about development in the North, not because they don’t agree with them, but because they are making no money out of them.